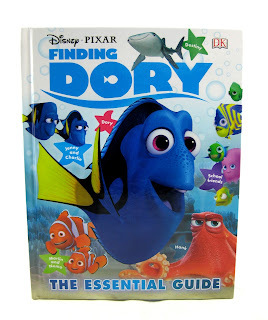 Another Pixar film, another Essential Guide! Ever since I was a kid, I always enjoyed DK publishing's Pixar "Essential Guide" books...and I still enjoy collecting them today! I actually look forward to these every year as they're always chock-full of lots of fun info about characters (i.e. traits, thoughts, backstory), plot points, fun trivia ("Did you know?" facts and "True or False"), quotes, stats and much more. They are definitely geared more to a younger crowed, but they're great for learning so many small details from the films that you might not get from just watching them. I say they're just as fun for adults, or at least I speak for myself. This new Finding Dory Essential guide (released on May 3rd) is no different in that regard. Inside this hardcover book you'll find 63 quality, insightful, colorful pages. I'm not gonna lie, this is a big improvement over last year's The Good Dinosaur Essential Guide. For example, that one was almost fully illustrated and was pretty light on the fun facts (or anything too interesting for that matter). This one goes back to the roots of the Essential Guide books with a far better balance of screen caps from the film, fully rendered characters and illustrations. 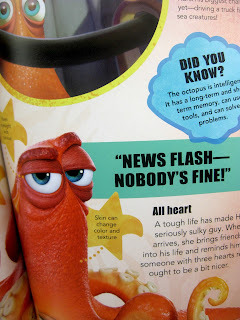 There is a lot of fun info to read and learn here- especially since there are plenty of real life fish/ocean facts that any age group would find interesting. This page featuring the "shhhhing" hermit crabs is one I find particularly cool. It's hard to tell in the film what all the crabs are wearing as shells, but this gives you a clearer look! I love seeing the football helmet crab here (remember the blind bag collection figure? ), since I have yet to actually spot him during the film. I keep a lookout every time though! I guess I just need the ability to pause and examine the scene (bring on the blu-ray). Check out my "Books" label to the right of this page to explore my growing collection of Pixar books, including the many other Essential Guides that I own. Note: You can find an Essential Guide book for every Pixar film except for A Bug's Life. 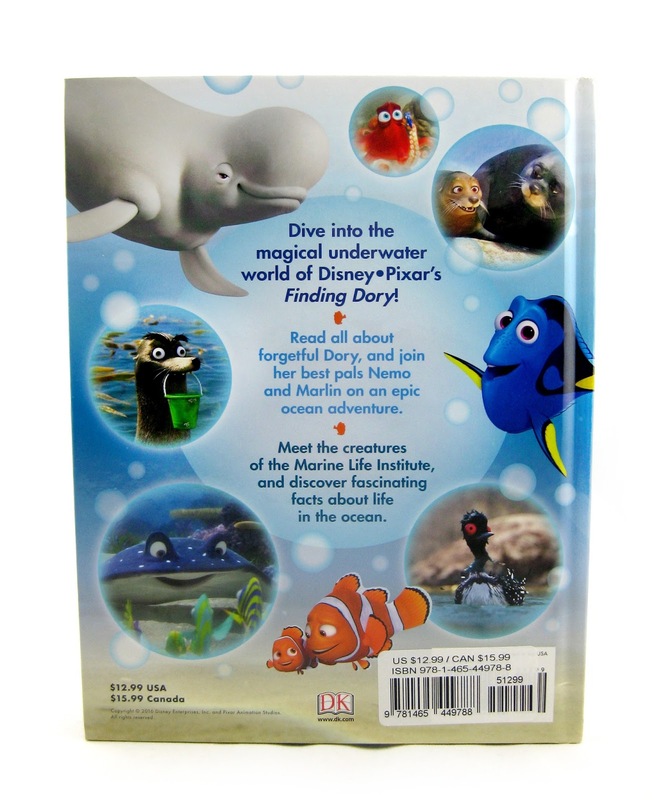 If you're a fan of Finding Dory, I definitely recommend picking this up. You can currently find it easily in stores (like Barnes & Noble) or on Amazon using the direct link below. Thanks for visiting today's post and be sure to check back daily for even more items from my Pixar collection!